Paulig continues the discussion of the bright future of coffee and introduces different phases of coffee production with the journey of Happy Beans from plant to cup. Paulig aims at making the world’s best coffee and believes that it is possible only with high-quality, tasty beans that have gone through a happy value chain. Paulig introduced at the beginning of 2018 a horror scenario to friends of coffee: Blend 2080, a coffee without coffee. Paulig wants to offer enjoyable coffee experiences also in the future and the future joys of coffee will be ensured only through responsible operations. Happy Beans present sustainability actions in the entire value chain of coffee. “We have worked systematically over the long term to ensure that sustainability and sustainable development are integral parts of the everyday work of everyone at Paulig to make sure that the future generations will also be able to enjoy coffee breaks. We want to make the world’s best coffee, which is born only from beans that have gone through a sustainable value chain. The coffee beans’ journey begins in the farmer’s hands. Then their long journey continues to our roastery and from there into a coffee lover’s cup,” says Katariina Aho, Supply Chain Director at Paulig. The joy of coffee has multiple layers: taste experience is created by the drinking moment, atmosphere and place and, of course, the taste and scent of coffee. Sustainable and responsible coffee farming and production process have also an impact on the meaningful coffee experience and the aftertaste. Paulig is a family business that has cooperated with other family-owned companies or coffee farmers since 1876. Paulig wants to know its partners and their conditions well in order to produce high-quality coffee. In addition to the supply chain, the sustainability work is closely linked to the everyday work of Paulig’s personnel, safety of our products and the environmental friendliness of our operations. “Knowing the origins of our coffee is important to us. Our coffee beans come mainly from small family businesses facing many challenges, such as climate change and inadequate earnings. We believe that coffee farmers should be able to support themselves and their families and to ensure profitable livelihood also for future generations. Through our partnership programmes, we have managed to support hundreds of thousands of farmers to get a better return on the crops while offering tasty and meaningful coffee moments to coffee lover’s as well,” says Katariina Aho from Paulig. Approximately every hundredth coffee bean grown in the world is roasted by Paulig, which means about 60 million kilos of coffee each year. Paulig’s operations affect the entire coffee industry. Paulig will achieve a significant goal by the end of this year: all Paulig coffee will come from sources confirmed to be sustainable. In other words Paulig buys only certified coffee or coffee from carefully selected partnership programmes whose responsibility has been verified. Read more about Paulig’s sustainability work from Paulig Group’s Sustainability Report 2017 that has just been published. 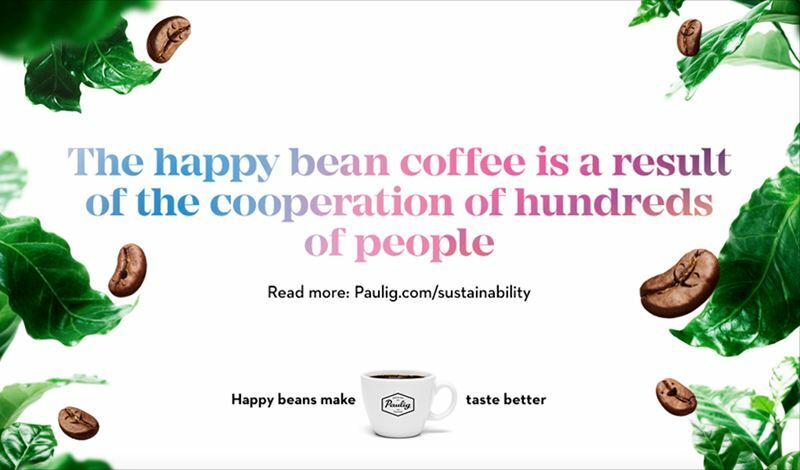 You can read more about Paulig’s Happy Beans story and coffee beans’ sustainable journey on Paulig’s websites where the entire value chain of coffee from plant to cup is introduced.